The Realistic PRO-26 is quite a challenging scanner to equip with a discriminator output. The receiver IC, a TK10930, is a VSOP (Very Small Outline Package) IC. Its pins are spaced 0,5 mm (0.02''). A 'normal' SMD has a spacing of 2.5 times this size. 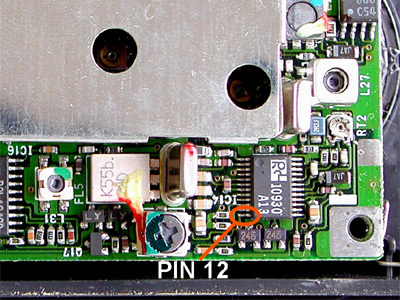 Pin 12 contains the demodulated baseband signal audio. Luckily, this pin is situated at the end of the IC, and not between two pins. One lead of a 10 k resistor is bent to follow the IC's pin exactly. Then, the resistor is connected a little to the outside of pin 12 using a fine tip soldering iron and a minimum amount of solder. The resistor is fixed to the IC with a drop of glue from a glue gun. This prevents damage to the IC pin when inadvertedly mechanical stress is applied to the resistor. A 3.5 mm mono socket is mounted in the back of the scanner. 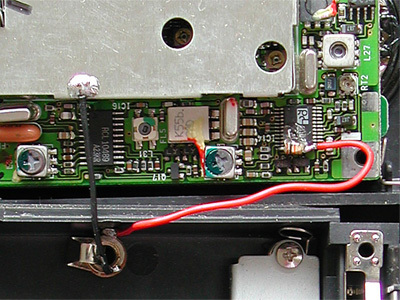 The ground lug is connected to the scanner's metal shield (black wire). 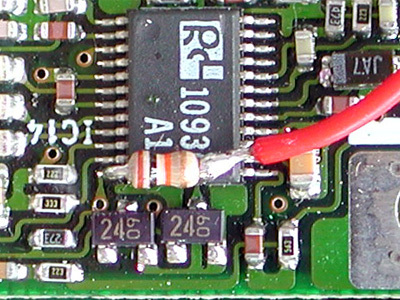 The 'hot' lug is connected to the 10 k resistor (red wire).